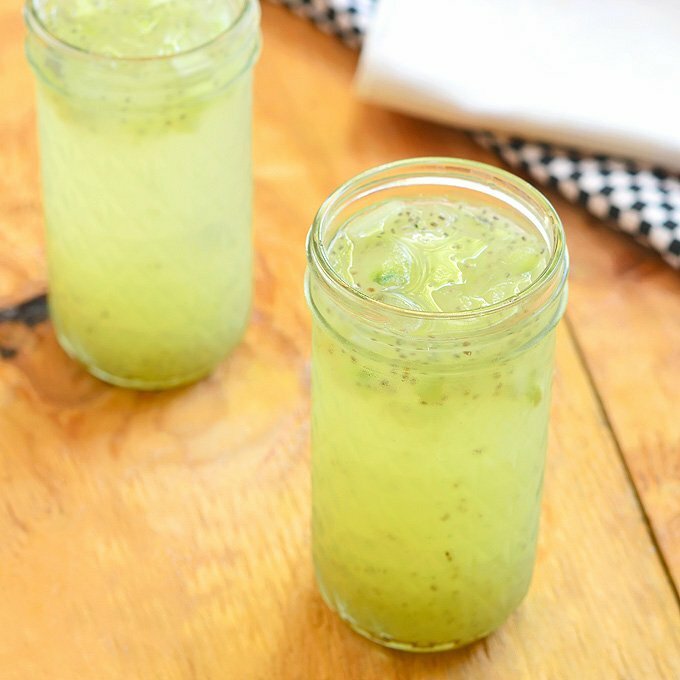 Cucumber Lime and Chia Fresca is a refreshing drink you’d want all summer long. With fresh cucumbers, freshly-squeezed lime juice, and superfood chia, this aqua fresca is a healthy and delicious way to hydrate! I love Mexican food of all sorts and I am just as fond of their many varieties of aguas frescas. Summer or not, I can’t visit a Mexican restaurant or grocery store and not indulge in an extra large styrofoam container of these flavored drinks. 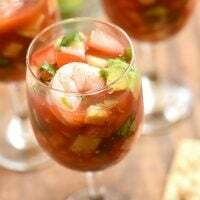 Light and refreshing, they provide the perfect counter-balance to the strong, spicy flavors of the cuisine. Aguas frescas or “fresh waters” are non-alcoholic beverages made by blending fresh fruits, grains, seeds or flowers with sugar and water. If you frequent Latin taco stands, supermarkets or eateries in the U.S., you’ve probably have seen colorful rows of these cool waters in large plastic containers. Not only are these fresh waters the perfect thirst quencher, they’re so easy to make at home, too! 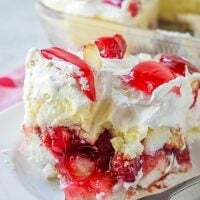 You can use just about any fresh fruit in season to whip up a few batches at home. 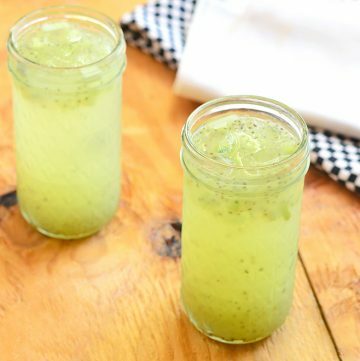 I love to keep pitchers of horchata and tamarindo in the fridge to keep us cool during warmer months and I am so excited to add this cucumber, lime and chia fresca to our line up of summer refreshments! A powerhouse of vitamins and minerals from cucumbers, freshly-squeezed lime juice, and chia seeds, it’s a delicious and healthy way to hydrate. I like to sweeten our drinks with simple syrup but you can substitute honey or agave nectar if you prefer a healthier sweetener. Enjoy! Cucumber Lime and Chia Fresca is a refreshing drink you'd want all summer long. 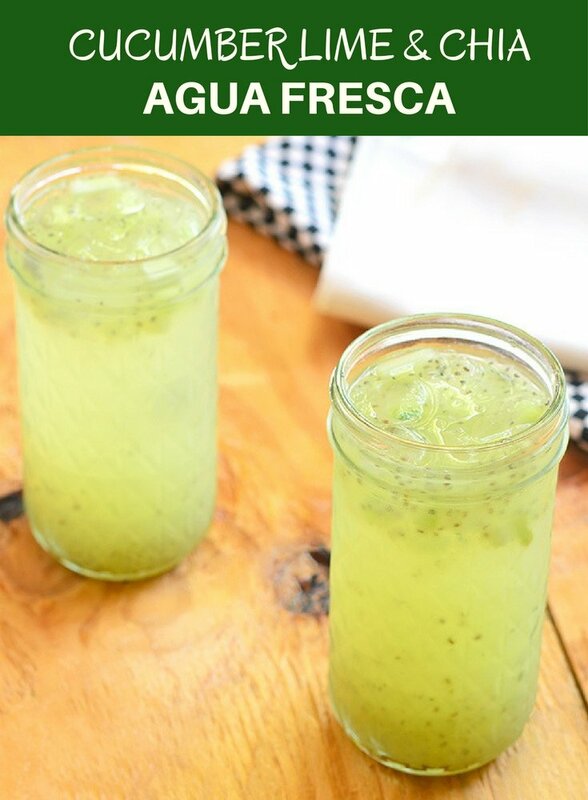 With fresh cucumbers, freshly-squeezed lime juice, and chia, this aqua fresca is a healthy and delicious way to hydrate! In a sauce pot over medium heat, combine water and sugar. Heat until sugar is dissolved. 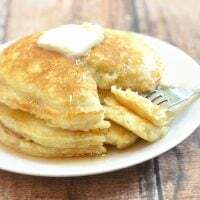 Remove the simple syrup from heat and allow to cool completely. In a blender, combine 2/3 of cucumbers and 2 cups of the water. Process until smooth. Using a fine mesh strainer, strain mixture. In a large pitcher, combine the strained cucumber water, chopped cucumbers, the remaining 2 cups water, lime juice, and simple syrup. Add chia seeds. Stir well to combine and allow to stand for about 10 to 15 minutes or until chia seeds expand. Serve in a tall glass over ice. I am always dehydrated! I can’t wait to drink this all day!!! I have 10 lbs of chia seeds that I bought on special for 3$ a pound! 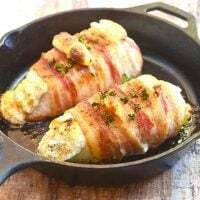 This recipe is even easier (and healthier) if you own a high-powered blender such as Vitamix, BlendTec, etc. Just peel the cuke and then blend it whole with the water and lime juice. No straining will be needed, as the cuke seeds and fiber disappear during the blending. Then simply stir in the chia seeds, wait ten minutes, and serve over ice. So delicious! I only had one cuke in the fridge, and also happened to have some frozen cubes of lemon sugar water in the freezer. After adjusting the ice and the water accordingly, I threw everything but the chia seeds in the VitaMix. The lemon-lime-cuke combo was so refreshing, and it was also good to know that I had Vitamin C from the citrus, calcium and magnesium from the chia seeds, and a whole veggie serving from the cuke. Awesome! where to buy the chia seeds?